In a separate bowl, sift together the flour, baking powder and baking soda. Stir into wet mixture until well combined. Put in refrigerator for 1 hour. Roll into 1-inch balls, roll in sugar, place on cookie sheet, and place in a preheated oven that was set to 375 degrees for 10 minutes, or until golden brown. 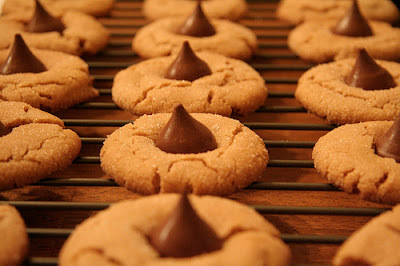 As soon as the cookies come out of the oven, place a chocolate kiss in the center of the cookie, being sure not to press too hard. Hubby Rating: 11! There is no better combination than chocolate and peanut butter, at least according to my hubs!! Hope you enjoy these as much as he does!!! Happy baking!